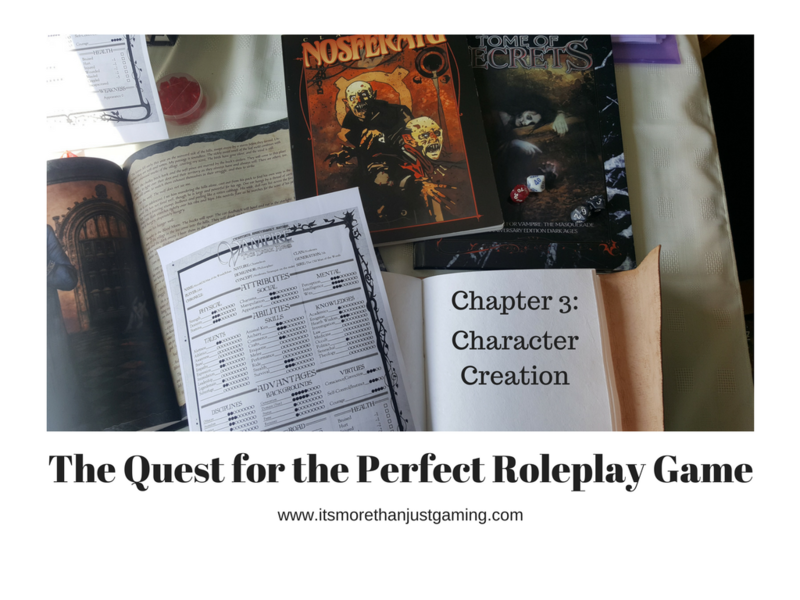 Hello again, and welcome to the next in my series of posts about finding the perfect roleplay experience. In today’s post I am going to talk about character creation. I am going to make an assumption here, because I have to. I am going to assume, that whatever your purpose for play whether it be to tell a story or to see a character progress up the hierarchy, that you want to play a character, rather than a collection of stats and dice values. I am going to assume you want to create an alternate persona that has a life, goals and foibles. I am going to assume you are invested in your game and want to contribute to it. Still with me? Good. First and foremost, character creation shouldn’t happen in a vacuum. And by that, I mean there should be a general discussion in your group about what people are wanting to play. This helps in adventure based games as it allows players to create characters that best suit their group needs. For instance a party of level 1 wizards in Dungeons and Dragons is likely to get slaughtered at the first encounter with an orc barbarian. More than that, it allows for creativity as a communal discussion allows for players to create links between their characters before play starts, avoiding awkward contrived situations where player characters clumsily come together. There are also some major advantages for the Games Master in facilitating a general discussion. First, you can estimate if the party will actually work together well. So, using a DnD example again, imagine one player wants to play a chaotic evil dwarven fighter, whilst another player wants to play a lawful good human paladin. It is potentially possible for skilled players to have those two characters in a party together, but I wouldn’t personally bet on it. The simple fact is, unless there is some major common cause binding the two, they are basically opposed to one another and more than likely to try and kill one another. I’m not saying don’t have differences in the group. Some of the most fun roleplay happens when the characters aren’t the best of friends. If you have read my series, the Mycroft Journals, you’ll note there is constant friction between Ethan and Ettori (I play Ethan, Ettori is played by my friend). At character creation Ettori was established as a devout man of the cloth (equivalent of a Dark Ages bishop) whereas Ethan has little faith in the clergy as his experience with them have not always been favourable. This adds friction between the characters, which is fun to play. Particularly if we get into the swing of bickering and riff with it whilst the GM looks on in bemusement. It would have been entirely different if my character had a burning hatred for clergy and a need to remove them from his path. That would change the game to player versus player very quickly. There is nothing wrong with that if that is what the players want, however it wasn’t what we wanted. Doesn’t mean Ethan won’t eat him some day (They are both vampires), however he would have to do something awful to make my character resort to something so final. The second advantage for the Games Master is that as the characters start to form, they can see what sort of stories will be most appealing to them. So, if all the players create characters with combat backgrounds, then participation in a war story isn’t unreasonable. If they are sneaky, perhaps it is about thieving or espionage, or intrigue. If they are seekers of knowledge, perhaps the stories are quests to broaden their knowledge base. The early discussions of character creation should provide the Games Master plenty of material to make stories. Saying all of this, it is entirely appropriate to treat this discussion as general and preliminary. In fact, it is perfectly reasonable for players to create secrets for their characters that the other players don’t know. These can be discussed privately with the Games Master next, as you probably want to have chat with them about your character’s goals if left alone. Ok, so you have had your general discussion. You spoke to the Games Master about your ideas for where you want to take your character. Next, you really want to give your character a full background. Perhaps you created a basic background to give you ideas for your first discussions. Maybe you are still creating the same character, maybe you changed your mind based on the group. Either way, you have had a discussion about where you fit in the game and where you are going. It is now time to fill in where you have been. Here is another example of a recent Character Creation. I am starting in a 5th Edition Dungeons and Dragons game with some friends. We had had several discussions, which ultimately had my first ideas vetoed, however, I was left with an idea that I wanted to play a Dwarf whose clan was a leader in the magitec business (technology based on magic. I wanted industrial setting appearing, but the other players vetoed. They were fine with Magitec though so I adapted). I created Hadrin Coraldeep of the Coraldeep Clan. I created for him a background that included a brief clan history, why they did what they did and why they were where they were. I gave him a relationship with the Elder of the Clan (He is Hadrin’s Grandfather) and suggested a motivation for him choosing to go and be an adventurer. The Games Master suggested some modifications to make it a bit more interesting, which I accepted (because they were) and I created his entire background as a Tidebreaker in Coral Keep. (A Tidebreaker is a soldier in the Coraldeep army that is trained fight sea monsters underwater as Coral Keep is a large off shore platform where the Coral Deeps build their boats and Dirigibles). I did all of this never once mentioning what class I wanted to play. Being a member of the army made fighter or ranger seem logical, but cleric, rogue, warlock or mage were equally possible. I then had another discussion with the players and I settled for a Dwarven Fighter. So, multiple discussions with the other players, and the Games Master and a detailed background were all done before I ever decided on a class. Or, to put another way, that was all done before I ever filled in a character sheet. You might find this to be a lengthy process. If you are playing a game that is intended to be a one shot adventure over 4 sessions, then perhaps it is a bit much. However, if you are going for a long haul game, then you owe it to yourself and the other players. Characters that are fully fleshed out with motivations and goals, that are intended to be able to mesh reasonably well with the other characters are a good way to insure longevity of your campaign. The amount of detail that went into Hadrin’s background was somewhat less than Ethan, however it proved to be important. We had our first Game not that long ago, where Hadrin was supposed to meet up with one of the other characters as part of our shared back story. Hadrin was sent as an envoy to a rival Dwarven Clan, where Koivu (the other player) was kept as a slave. I was there to bolster relations, being just closely enough related to the Elder to make it seem like an honourable gesture, but far enough away to be expendable. My retinue were there to destroy our rivals, unleashing a Riptide Drake (A Water Elemental the same magnitude of power as the second most powerful dragon in Dungeons and Dragons, invented by the Games Master as a result of my background. I love the name Riptide Drake). I spent the entire game being a diplomat, and then trying to stop people from drowning when the Drake was unleashed. Here is why the background was imperative. If I had simply created a Dwarven Fighter called Hadrin, the game might have been boring as I never ventured into combat once. It was all roleplay, and story evolving. In fact, the banter my character had with the leader of the rival dwarves was fantastic, particularly when it was at the expense of visiting Drow. Because my character had a full story, it didn’t matter if he didn’t get to be a fighter in that game. Having the background made him more than the sum of his stats, meaning I had probably the most enjoyble game of Dungeons and Dragons I have ever had. I think I have one final piece of counsel for the Games Master. Don’t be afraid of saying yes to a player who makes a reasonable request. If the request is balanced, reasonable and unlikely to break the game, veer toward saying yes. Don’t do it unconditionally. If a player is wanting part of their story to be X, that doesn’t need to mean they start there. It just means you are agreeing it is part of their story. If you are playing a game where characters can have allies or lackeys, no problem. If a player wants them and they are reasonable, then fine. But make them justify them. Why is the mayor in your pocket? What is their name? What is their family situation? The same applies to games where you can start with items or cool abilities. Ethan, my vampire, has a number of cool abilities that are non standard even for vampires. He can see in the dark. He can’t be tracked and he is basically invisible when he sleeps. All of that makes him perfectly suited to survive in the wilderness. How did he get them? The one who created him taught him these gifts so he could survive the wilderness (I even created an idea of a subset of the Nosferatu Clan, the Old Men of the Woods), so that he would always have the ability to draw enemies onto a different battlefield. Character creation can be done in an hour, but if you are playing a campaign over a significant length of time, then you have to consider the effort suggested here. I promise you, it is worth it. Just remember, it is all about having fun.